Welcome to the website of Eastbourne Parade Bowls Club. We are a progressive bowling club with a membership of progressing ages and abilities that prides itself on its informal approach to encouraging an atmosphere of friendship and comradeship whilst maintaining the traditional etiquette of bowling for the full enjoyment of the sport. Our membership consists of lady and gentlemen players progressing from the novice stage to those more accomplished bowlers with a pedigree of experience, from the young to the more mature, all who enjoy a game in pleasant attractive surroundings on the coastline of our seaside town. We are also affiliated to the appropriate bowling federations and have teams in the respective ladies and men's local leagues. The club's 12 rinks receive regular ground maintenance and we continue to make the necessary improvements to make it one of the most enjoyable playing surfaces to bowl on. This success has seen Parade Bowls Club and rinks attract a number of Ladies County matches being played here. Throughout the season, our bowling rinks are open daily to the public for the occasional and new players who prefer to play and pay a competitively priced green fee. 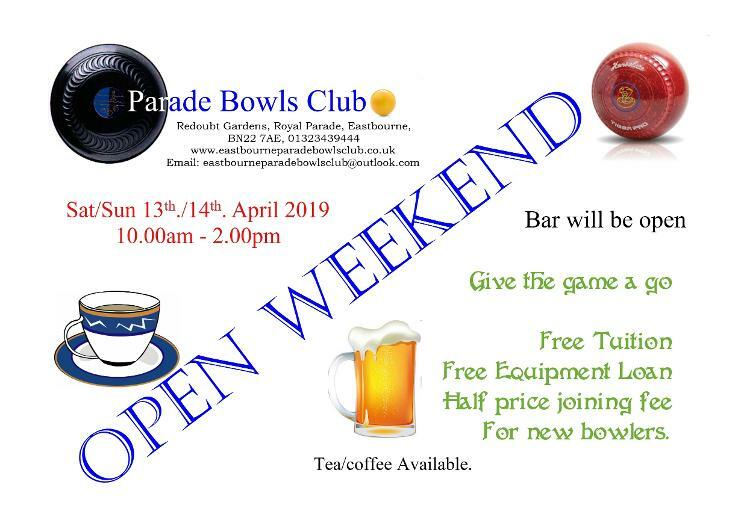 ( availability may be subject to pre booked tour matches) We have the necessary bowls equipment to hire for a small fee, and we also have the facilities to provide you with a cup of tea or coffee. The club house boast a small but comfortable licensed bar and lounge area where you can relax in pleasant surroundings and offers a selection of alcoholic beverages which are favourably priced in comparison with many local hostelries. The season sees many touring sides booking matches with us, with many returning visits from the previous seasons. We like to welcome back old acquaintances from previous years, but also welcome the opportunities to host new visitors. If your club is interested in booking a match, or as an individual you wish to come along for a game with friends and family, you can find all the required details on our contacts page. We look forward to hearing from you and welcoming you to one of the most up and coming and attractive bowling greens in Eastbourne.